Who knew that you could find quiet beaches, secluded hikes, pristine snorkeling, and an environmentally friendly resort in the Caribbean without shelling out hundreds of dollars a night? Todd and I certainly didn’t until we happened upon St. John’s USVI and the Concordia Eco Resort. On a whim, Todd and I decided to go to the Caribbean over Christmas. Not exactly the cheapest place to visit that time of year! Just as we thought it wouldn’t work out, without a huge financial commitment, we came upon an article I had torn out about snorkeling Waterlemon Cay on St. John’s and the Concordia Eco Resort. We called immediately and, as luck would have it, they had one room left for the nights of our trip. We couldn’t have imagined a better Caribbean experience. Even at the busiest time of year in the Caribbean, we found ourselves frequently alone on hikes and on beaches. Thanks to philanthropist John D. Rockefeller, approximately two thirds of St. John’s is preserved as a US National Park. This means that for most of the island there are few roads, mega resorts, mobs of sunburned tourists, or drunk cruise ship passengers over running your paradise. Cruz Bay, despite being a port town, is remarkably laid back and retains it’s charm. Coral Bay, on the opposite side of the island, is even smaller and more laid back than Cruz Bay. It does have amazing dining, however. (See Food Finds post on restaurants here). So, what to do while you are on this paradise? The options are numerous but here are some of the things we did which turned out to be fabulous! Waterlemon Cay surpassed our expectations for snorkeling. To get to Waterlemon Cay, you hike along a beautiful trail around Leinster Bay. You can snorkel all the way around Waterlemon Cay but be mindful that with strong winds, the far side can be a bit rough for a novice swimmer. Be sure to bring a picnic lunch and sunscreen. Combine this with a hike up to the Anneberg Ruins for an amazing day of sun, snorkeling, views, and sheer Caribbean beauty. Then of course there is Trunk Bay, Hawksnest, Cinnamon, and Maho Bay. These have all been written about extensively and rightly so. Beautiful, beautiful beaches. FYI – Trunk Bay does get a lot of day-trippers from the cruise ships. We went here later in the afternoon and had the beach all to ourselves. No skinny dipping this time. Driving is of course a small thrill unto itself on St. John’s. You drive on the left side of the road and the steering wheel is also on the left. Not too bad getting used to. The roads are narrow two lane roads with sharp turns and 20% grades. Nothing scary, just fun. 4×4 totally the way to go. Todd and I stayed in Premium Eco Tent #19. A permanent canvas tent with everything a happy camper could want. Full pan and dish set with 2 cooking burners, a sink for washing dishes, a cooler chest for food / beverages, a separate smaller building with solar shower / WC, and endless beautiful scenery. Potable water stations are located everywhere. The way the tents are situated it is almost impossible to have any of your neighbors get a glimpse of you unless they are really motivated to do so. Given the secluded setting of each tent, you can (and should) unzip all of the walls of your tent and let the amazing breezes blow through your tent along with the sounds of the sea and the glimmer of the stars. In the event you don’t feel like leaving this great place, the food here is very good as well. St. John’s was a serendipitous, spur of the moment Life Bus experience. One I could repeat year after year! Enjoy this Caribbean jewel. Oh yeah, don’t forget to keep a look out for the donkeys and sheep that roam the island freely. When I was 17 years old, I took a road trip down the California coast with my best friend’s family. It was the first time I had experienced a road trip not jammed in the back of a Stay-Wag with 3 older siblings torturing me along the way or a car full of cigarette smoke with the windows rolled up – it was actually an enjoyable experience. 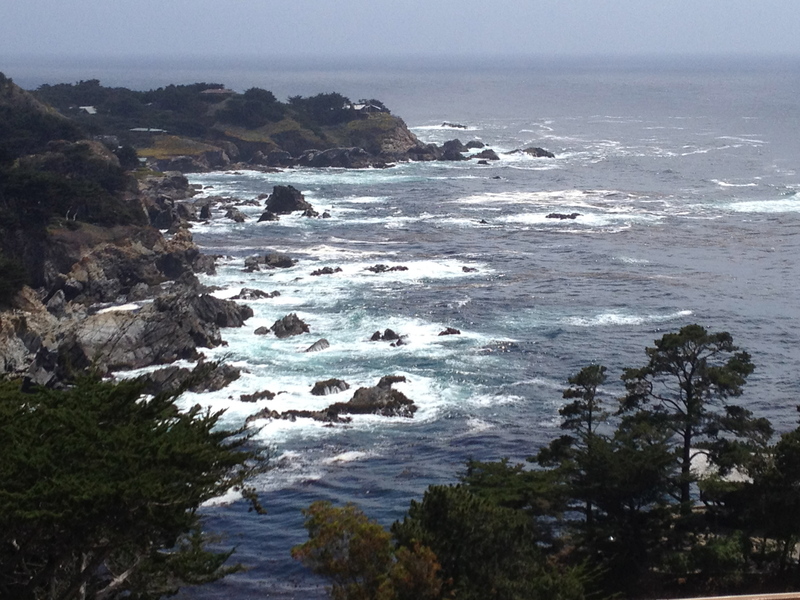 Fast forward 30 years later and Greg and I are on a road-trip passing through Carmel via Big Sur. I did some research on hotels via Trip Advisor and found that the Tickle Pink Inn is ranked the #1 spot to stay in the Carmel area. (You have to get over the name, it really is a beautiful place.) I quickly got on the phone with the hotel and reserved a room for the night – with an ocean view – happy early birthday to me. 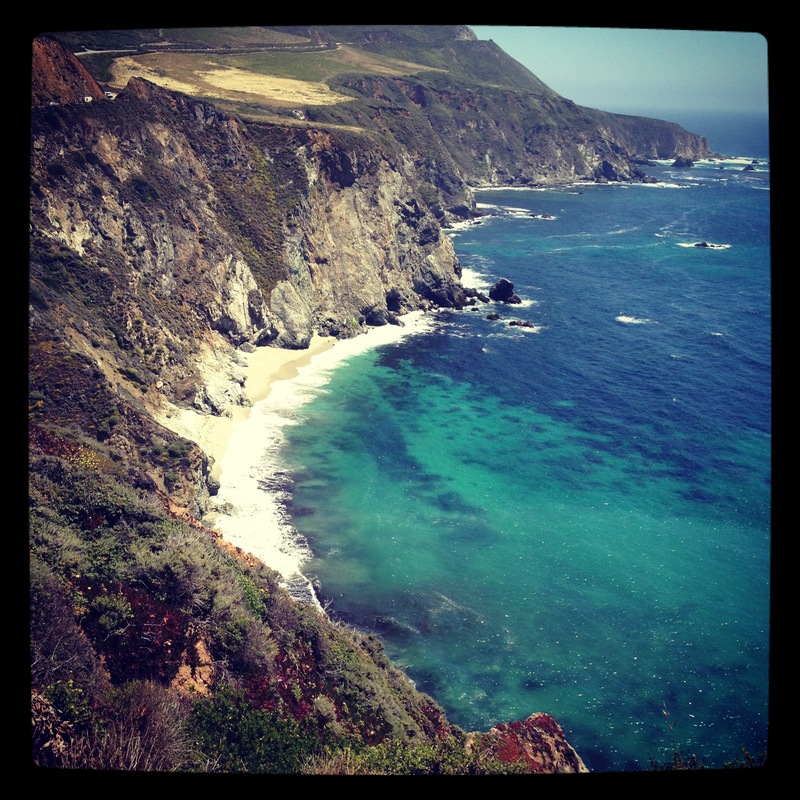 And by the way, If you have never been to Big Sur, it is incredible and a must see. This boutique hotel is a great buy. It is somewhat expensive i.e, $250 + range but, you get all sorts of free stuff and free stuff = good stuff. There is an excellent wine and cheese reception that is really nice AND, you are presented with a complimentary bottle of champagne when you check in. The risk here is that you get so loaded you can’t drive to dinner and they don’t have a restaurant on site. Continental breakfast is included in the rate. The breakfast is a little on the cheap side with what appears to be a bit of Costco ilk, however, it is free and they will deliver to your room. Key Tip: Request a room with an ocean view and a private balcony. You will be completely fulfilled waking up to the sight and sound of waves crashing along the shore line. This means paying a little more, but it is worth it. Beware of overly healthy seagulls attempting to infiltrate your room if you leave the sliding glass door open too long. 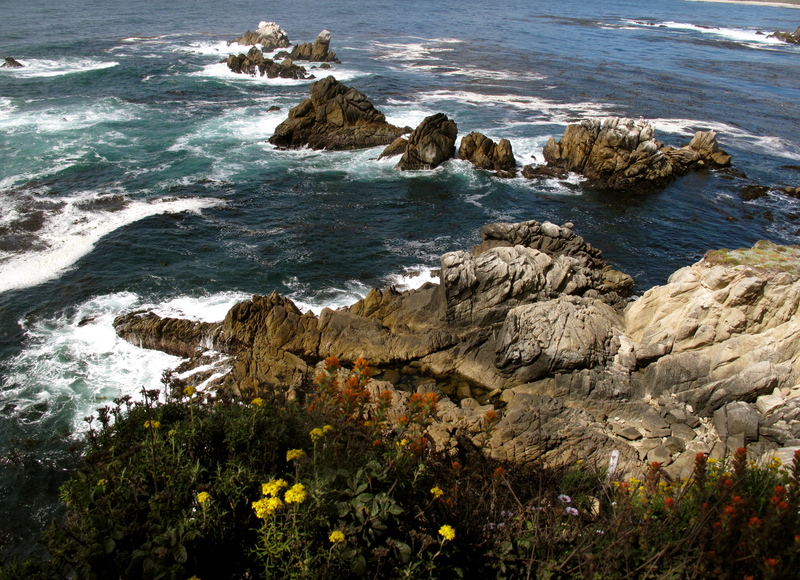 If you feel the need to get out and burn some calories while you are in Carmel, check out the Point Lobos Reserve www.pointlobos.org. If you follow the North Shore hike, you are guaranteed to spot some gorgeous harbor seals lounging around on the rocks along the coastline. Look closely as they sometimes blend in with the colors and patterns of the rocks. If you are over 40 and have younger kids with you, have them spot those wonderful creatures. These trails are great for trail running if hiking is too tame for you. Also, you can get a nice 1 mile run/walk on the beach which you can easily access via Ocean Avenue in downtown Carmel. If you are into golf, you will have a nice view of Pebble Beach. Boutique shopping in Carmel can be quite fruitful. I found some amazing Frye boots (my new faves) at Lloyd’s shoes – they also have brands like Stuart Weitzman and Tom’s. Paloosh next door had some great stuff and carries brands like Ella Moss, Joie, and Splendid. They get a bad wrap on Yelp because of customer service, but I had a great experience. Girl Boy Girl (GBG) is another upscale boutique that may be considered one level up on the cost scale from Paloosh. They sell brands like Haute Hippie, Rebecca Taylor, and Trina Turk. As far as restaurants are concerned, if you are into Sushi, we found Sushi Heaven to be a great value and of excellent quality. The Carmel Valley Roasting Company is great for a cup of coffee, and the quaint La Bicyclette Restaurant was excellent for dinner www.labicycletterestaurant.com. The menu changes nightly and the food is crafted with fresh local, organic ingredients, much of which is supplied by a local Middle School. Carmel, is still a gorgeous place and will always hold a special place in my heart. All I have to say is THANKS to Raleigh and Judy for unknowingly introducing me to the life bus in 1982!